Google’s purpose-built robots cars are getting the green light to drive on public roads.This summer some of the self-driving cars will be tested on the roads around Mountain View, California, where the search giant is based. Before now, the small vehicles have only driven on test tracks and have not mixed with regular traffic. Google has tested autonomous vehicles on public roads but all of them have been heavily modified Lexus SUVs. The robot cars will not be completely autonomous, but will have safety drivers on board who can take over if needed. “Every moment has been building towards putting these cars on the roads where we can start learning even more from them,” said Jaime Waydo, systems engineer in the self-driving project, in a video released to accompany the announcement. eventually the purpose-built robot vehicles will not have a steering wheel or any other control though detachable versions will be used during the forthcoming road tests. The top speed of the cars will be capped at 25mph (40km/h) during the tests. In preparation for their public debut, said Ms Waydo, the cars had been put through a series of demanding reliability and durability tests. Each vehicle has been clocking up thousands of miles each week on the test tracks – some of which resemble Californian highways and streets. Mixing with real-life traffic will help Google engineers refine the on-board software to cope with many situations the cars have not encountered during testing, said project head Chris Urmson in a blog post. “Getting these cars out in to the public and allowing people to react to them, allowing us to see them out there, that’s a huge deal and most importantly it’s the necessary step to getting them to drive themselves,” he said. As Google’s autonomous car programme rolls inexorably forward, it’s tempting to think the days of the human car are numbered. But it isn’t that simple. The company has shown that autonomous cars can run reliably on well-mapped and predictable routes, but they are a long way from being able to cope with the unprogrammed chaos of a city centre at rush hour. And what happens when there’s an accident? Questions of liability still have to be solved, and traffic laws updated to take account of driverless cars. Yet autonomous technology is already here. Many mainstream carmakers have well developed research programmes of their own. Self-parking, adaptive cruise control and emergency braking systems can be found on a number of cars on the market today. So the transition to driverless technology is likely to be a gradual process, with the role of the human at the wheel becoming less important over time. 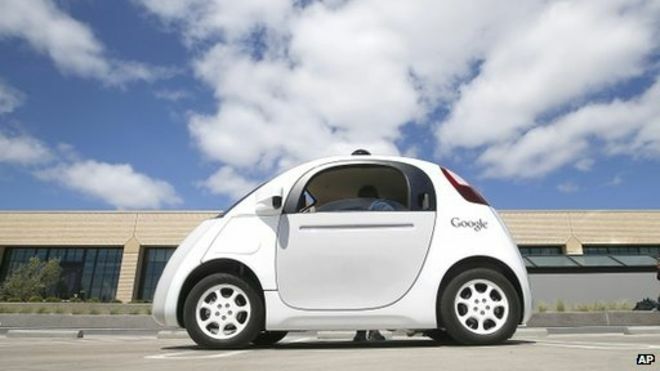 In addition, said Mr Urmson, the public test would let Google gauge how other road users react to the robot cars. Figures released earlier this week show that four out of the 48 self-driving cars tested on public roads in California have been involved in accidents in the last eight months. The car makers involved, Google and car parts maker Delphi, said the bumps were the fault of humans in other cars. The Google cars involved in these earlier tests are modified Lexus SUVs rather than the purpose-built robot cars. News about the public road tests came soon after Google announced a new prototype of its pod-like autonomous vehicle. In the UK, the government has put cash behind four projects that will test robot cars on public roads in Greenwich, Coventry, Bristol and Milton Keynes.